For the complete post, click here. I'm always looking for creative ways to blog about the 'little things' and the photographer in me is always looking for something to do with the 1000 pictures I take each month. Put the two together and what do you get? 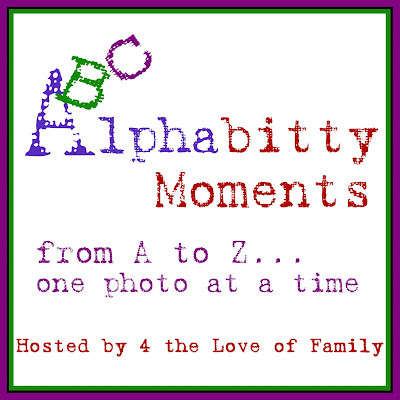 A new blog carnival called Alphabitty Moments! The carnival starts, Thursday, February 26th with the letter 'A' . Then for the next 25 weeks we'll all work our way through the alphabet, photographing "a little thing" that begins with the letter of the week. Feel free to work ahead if you want. I know I like to be able to write when I can and then use the schedule post option to spread out the frequency of my entries. Simply post your photo of the week and then stop back here to add your name to the Mr. Linky. I'm really looking forward to seeing the variety of things people can come up with for each letter! But you can keep it as simple as posting a picture and the letter of the week. Writing the significance of the photo is optional. 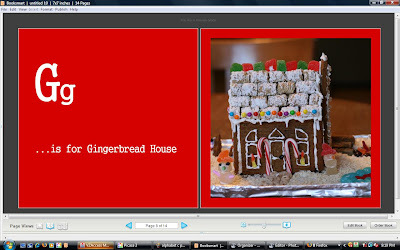 My Alphabitty Moment: My kids were so proud of their gingerbread house and are always pointing out which parts they worked on. They will love seeing their masterpiece in a book one day. The other idea I have is to print the pictures to make personalized flashcards. If you have more than one child, you can post pictures for each of them. I plan to start back over at the beginning of the alphabet after we get to Z so you have the option to do a second series then or post mulitple pictures each week. Won't it be fun to see how each child's alphabet changes from cycle to cycle? Hope to see you on Thursday for the first installment of Alphabitty Moments! I'm in! I don't think I can download the software even though it looks so nice because our computer memory is 75% used up. Mine will just be regular blog...but still fun! I LOVE your button...we'll get to put in on our blogs to advertise, right? oh Carrie! I am so excited for you... this is just a wonderful idea! I can not wait to participate!